In this picture, It is showing that the person in it is climbing a mountain. This mountain does look pretty hard to climb and it looks very high. Now this person is just trying to reach the goal of seeing the sunset. It looks very hard but in the end, the person made it to the goal of reaching the top of the mountain to see the sunset. To never give up you must be ready to fail sometimes. You also need to be ready to push your self to your limits. As you can see in the picture the person is pushing to finish what he/she is trying to accomplish and as you can see it must be extremely hard to push a boulder up a hill like that and he is pushing hard without giving up. While doing that they probably failed a lot of times and he is still going up the hill. The song is talking about never giving up on a person even how hard it is. Some parts of never giving are physical but some are not and you may not have to use any physicality on the thing that you are never giving up on. Just like in the song. Some things are even like never giving up on a test or never giving up on a person. This picture is a great example of never giving up. The person in the picture is working hard to achieve the goal of what they want to do. 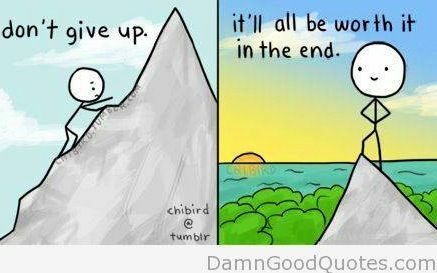 The is probably struggling to finish the clime but it shows that he/she is moving t achieve the goal.